The following text is taken directly from the AAVSO Hands-On-Astrophysics teaching manual. Seven stars form the Big Dipper, the well-known asterism in Ursa Major, which is among the oldest recognized patterns in the sky. It is a prominent pattern of bright stars and is circumpolar for mid-northern to polar latitudes in the Northern Hemisphere. Interestingly, although the pattern represents a variety of objects to many cultures - a plow, wagon, coffin, skunk, camel, shark, canoe, bushel, sickle, even a hog's jaw - stories about this constellation may date back to the Ice Age when ancient people could cross over the Bering Strait to North America. At that time, cultures in both Siberia and Alaska shared a common heritage. It is even thought possible that the constellation actually got its name 50, 000 years ago when a Paleolithic bear cult existed. A recurring theme that runs through mythology is the kinship of bears and humans. Bears can lumber along on all fours, or stand up on their hind feet and gesture with their front paws. 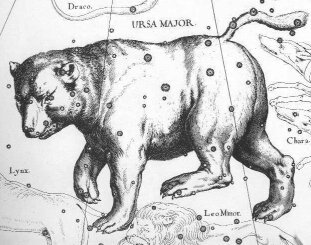 Ursa Major, in its travels throughout the heavens, constantly changes from quadrupedal to bipedal positions, seeming to run along on all fours nearest the horizon and then rising to its hind feet to begin the ascent back into the sky. There have been many fairy tales and fantasies written about people taking the form of bears. In some cultures bears are regarded as gods. The Micmac Indians of Nova Scotia and the Iroquois Indians along the St. Lawrence seaway share one story about the Big Bear. In this story, the quadrangle of the dipper represents a bear that is pursued by seven hunters; the three closest hunters are the handle of the dipper. As autumn approaches, the four farthest hunters dip below the horizon and abandon the hunt, leaving the closest three hunters to chase the bear. The hunters are all named after birds. The closest hunter to the bear is named Robin, the second closest is Chickadee, and the third is Moose Bird. Chickadee is carrying the pot in which the bear will be cooked. The second star in the handle is actually two stars [the famous double star system] called Mizar and Alcor which represent Chickadee and the pot. In autumn, as the bear attempts to stand up on two legs, Robin wounds the bear with an arrow. The wounded bear sprays blood on Robin, who shakes himself and in the process colors the leaves of the forest red; some blood stains Robin and he is henceforth called Robin Redbreast. The bear is eaten, and the skeleton remains traveling through the sky on its back during winter. During the following spring a new bear leaves the den and the eternal hunt resumes once more. A Roman myth involves both bears, Ursa Major and Ursa Minor. A beautiful maiden, Callisto, hunting in the forest, grew tired and laid down to rest. The god Jupiter noticed her and was smitten with her beauty. Jupiter's wife, Juno, became extremely jealous of Callisto. Some time later, Juno discovered that Callisto had given birth to a son and decided that Jupiter must have been the father. To punish her, Juno changed Callisto into a bear so she would no longer be beautiful. Callisto's son, called Arcas, was adopted and grew up to be a hunter, while Callisto continued to live in the forest. One day Callisto saw Arcas and was so overjoyed at seeing her son that she rushed up to him, forgetting she was a bear. Arcas thought he was being attacked and shot an arrow at Callisto. Jupiter saw the arrow and stopped it from hitting Callisto. To save Callisto and her son from further damage from Juno, Jupiter changed Arcas into a bear also, grabbed them both by their tails, and swung them both into the heavens so they could live peacefully among the stars. The strength of the throw caused the short stubby tails of the bears to become elongated. 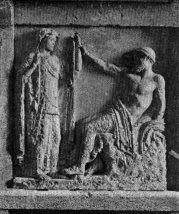 Juno was even angrier with Jupiter and managed to exact still more revenge on poor Callisto and Arcas. She went to the gods of the sea and forbade them to let the two bears wade in their water or streams on their long and endless journey around the pole star. Where the new constellations nightly rise, And add a lustre to the northern skies. Arctos, sole star that never bathes in th' ocean wave. The bear now sets except in high latitudes, but in Homer's day and long before, these stars did not sink below the horizon or drop into the seas. An Arab myth associates this asterism with a funeral. The quadrangle represents a coffin and the three handle stars are people following the coffin and mourning. The middle star (really the two stars Mizar and Alcor) represents the daughter and son of al-Naash, the man in the coffin, who has been murdered by al-Jadi, the pole star. Other cultures, too, relate funeral processions to the Big Dipper.